Source: U.S. Energy Information Administration, Annual Energy Outlook 2013 Early Release. A country's economy and its energy use, particularly electricity use, are linked. Short-term changes in electricity use are often positively correlated with changes in economic output (measured by gross domestic product (GDP)). However, the underlying long-term trends in the two indicators may differ. All else equal, a growing economy leads to greater energy and electricity use. However, in developed countries like the United States, the relationship has been changing for some time, as economic growth now outpaces electricity growth. As suggested by data over the past 60 years, EIA's Annual Energy Outlook 2013 Reference case projections through 2040 show that U.S. electricity use and economic growth will continue to be linked. However, the long-run trend of slowing growth in electricity use relative to economic growth will also continue: the rate of projected growth in electricity use will be less than half the rate of economic growth. In particular, EIA does not expect any sustained return to the situation between 1975 and 1995, when the two growth measures were nearly equal in value, or the earlier period in which the growth rate in electricity use far exceeded the rate of economic growth. Absent a very rapid introduction of some new electricity-using device—perhaps electric vehicles—a sharp rebound in electricity demand growth is not expected. While there is always uncertainty about future electricity demand, the efficiency standards for lighting and other appliances that have been in place over the past few years will continue to put downward pressure on growth as new equipment is added and existing stock is replaced. 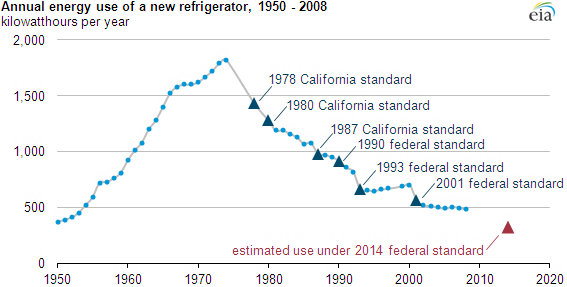 For example, a new refrigerator purchased today uses less than a third as much electricity as one purchased in the late 1970s, despite the larger size of today's refrigerators (see chart below). Source: U.S. Department of Energy, Office of Energy Efficiency and Renewable Energy, Building Technologies Office. Note: The standards are expressed as the maximum annual energy consumption for a product as a function of the product's adjusted volume. The growth in electricity demand has been significantly slower than GDP growth for decades. In the 1950s, 1960s, and 1970s the use of electricity often increased more than 5% per year. It then slowed to 2% to 3% per year in the 1980s and 1990s, and over the past decade it has fallen to less than 1% per year. 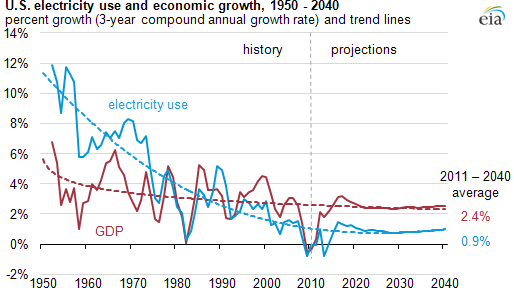 Over the next three decades, electricity use is expected to continue to grow, but the rate of growth slows over time. The factors driving this trend include slowing population growth, market saturation of major electricity-using appliances, improving efficiency of several equipment and appliance types in response to standards and technological change, and a shift in the economy toward less energy intensive industry.